Welcome to SunBiz 's free paycheck calculators. There is no charge to use our paycheck calculators. Simply click on a paycheck calculator below. Then enter your payroll information to estimate your paychecks. Use our payroll calculators as often as you need to. Use our payroll calculators as often as you like. They are automatically updated as payroll laws and tax tables change. SunBiz paycheck calculators, withholding calculators, tax calculators, payroll information and more. For personal and professional use.. Need a payroll company that can provide "Pay As You Go" workers compensation coverage? Call us at 941 756-1700. In addition to offering our payroll calculators, our goal is to provide a guide to the various steps required for setting up a payroll system for small business owners. Business owners with employees are responsible for federal and state income tax. There are several payroll tax reports that you are required to submit to the appropriate authorities on either a quarterly or annual basis such as, federal income tax, social security and Medicare taxes (Form 941) and Federal Unemployment (FUTA) Tax (Form 941), etc. All states also require payment of state workers' compensation insurance and unemployment insurance taxes. Forms are frustrating. But you're required to fill timely & file them, so the government knows who's been paid what. "Dual Scenario Hourly Paycheck Calculator!" Dual Scenario Hourly Calculator – Answers questions about how net pay will be altered because of benefit changes (open enrollment), relocation, pay raises, withholding adjustments, etc. This Calculator has two calculators appearing on one screen, making it easy to compare two different scenarios. "Dual Scenario Salary Paycheck Calculator!" Dual Scenario Salary Calculator – Answers questions about how net pay will be altered because of benefit changes (open enrollment), relocation, pay raises, withholding adjustments, etc. This Calculator has two calculators appearing on one screen, making it easy to compare two different scenarios.
" This advanced payroll calculator helps you plan for the future. Simply fill in your paycheck and 403(b) numbers. You can adjust the rate of return, contribution percentage and current plan balance to determine the value of your money in the future for your retirement. This information is shown in both graphical and table format. Similar to our 403(b) Planner, this calculator is designed for employees who work for non-profit organizations. Take home pay is calculated based on up to six different hourly pay rates that you enter along with the pertinent Federal, State and local W-4 information. This hourly paycheck calculator are for those who are paid on an hourly basis. 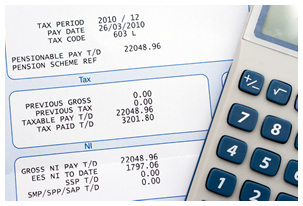 Use this gross pay calculator to gross up wages based on net pay. For example, if an employee receives $500 in take-home pay, this calculator can be used to calculate the gross amount that must be used when calculating payroll taxes. It determines the amount of gross wages before taxes and deductions that are withheld, given a specific take-home pay amount. This advanced payroll calculator helps you plan for the future. Simply fill in your paycheck and 401(k) numbers. You can adjust the rate of return, contribution percentage and current plan balance to determine the value of your money in the future for your retirement. This information is shown in both graphical and table format. This Canadian Calculator calculate your 2017 take home pay for all Canadian Provinces including Quebec.